It has been almost two months since I've posted. I just couldn't bring myself to do it. I felt like sharing what I wore or what outfit I was able to thrift for $5.00 just wasn't important. The truth is, it is important. Important to me and important for me. I'm well aware of my age and how rare it is to blog about style and fashion when you are in your mid 50's, and live in Indiana no less! This blog has given me a venue to have discussion about what's its like to feel invisible in a very visible world. And I missed it. I missed my bloggy friends and their witty comments. I missed the occasional off color comment and I really just missed you guys! I don't think I will be back with the same steam and thunder that I departed under but I'm ready to take some baby steps. Our family is still under a lot of stress. I have finally come to the conclusion that I have done all I can and the rest will just have to play out in time. Worrying isn't going to make it go away or make it better. That's the job of three old friends of mine, Faith, Hope and Love. I would like to thank all of you that took the time to check on me and offer inspiration. I know I didn't respond but, it meant more to me that I can ever express. Today we are off to a 90 degree cookout. Gotta love those family functions! This is what I wore. I started wearing maxi's last year and at the time actually got some odd looks. Now they are everywhere so I fit right in. I need a new trend just so I can be ahead of the curve!! My fellow Hoosiers would freak out over mullet skirts! Wait, now I'm really inspired! We'll have to see what can be done about that. The other day I read this quote. This is actually what inspired me to return. "Life will knock us down. We need time to heal, and the determination to get back up. Stronger"
Smile: Has been missing for a while! Hope to see it around more! I really laughed about your comment about fellow Hoosiers. I just happen to be one!! I love Indiana. However, this area is very conservative. I do wear my mullet and Maxie skirts......very much in the minority, though. I am glad you are back to blogging. Keep your faith, hope, and love! Tammy, I'm so glad to see you back! I've been thinking about you and hoping for the best for you and your family. It's good to have you back. Whatever your crisis is, you are weathering it looking the best you can! Congratulations on putting out that positive energy through style and spreading it around. It always comes back in a magic loop. I love your summery outfit. Wishing you the strength and perseverance to help you through the difficult times. The skirt is lovely, as is the scarf. Such pretty colors!! Tammy, I am so glad to see you back!! You look gorgeous....and I believe it is important to take baby steps when walking through difficulty. This baby step is a statement that you are not going to lose Tammy amidst this trial. One day at a time is the best way to go and I hope you will be here occasionally just to say I am choosing joy over despair. I will be in prayer for you and please email me if you have any specific prayer requests. Blessings!! Sending lots of love sweetie & thinking of you - so nice to see you back, we've missed you too! As you said, baby steps! Ahhh, my girl is back. We both left for a while but it is nice to know that we can pick right back up where we left off. I hope you are ok. You look damn good my friend. Love your spirit and this outfit. Getting back on the horse is what it's all about. Sorry about not emailing you, as I was in my own misery for a bit. Great to see you! Skirt is gorgeous and the price is expected with your skills. lots of love, dawn suitcase vignettes xoxoxo Have fun at the bbq...stay hydrated! So glad to see you back, Tammy. I've been checking here regularly waiting for your return. You look so beautiful and fresh in these colors. Keep hangin' in there and relying on those old friends you mentioned. Welcome back! You look beautiful. Glad you are returning to something that gives you joy! I'm so glad you're back...and I hope that getting back to blogging does help make you stronger. I've missed you and lifted up thoughts in the right direction. Happy to see you back Tammy! 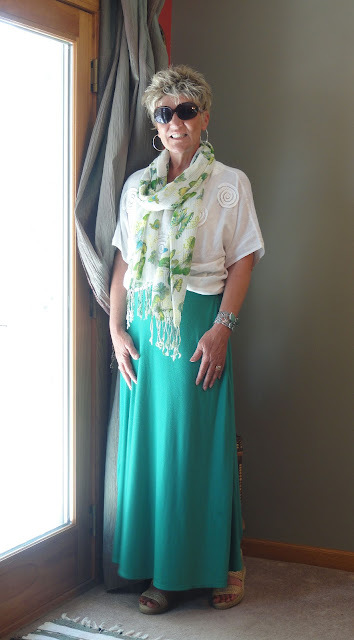 You look gorgeous in your maxi! I love your attitude...know that you and your family are in my prayers. I'm so glad your back, Tammy--I've missed you! Your outfit is gorgeous--but your sweet smile is the best. This scarf is so pretty! Happy you are making peace with your situation and getting back to blogging. welcome back! i hope that you and your family get the peace you're looking for. and in the meantime, post when you can and we'll be here to say hi! and regardless of age, you can be, and are, a very fashionable and beautiful woman! I have been thinking of you lately and wondering how you were. You look so fabulous in this outfit. Love the colors on you. I miss seeing your smiling face. It is odd that we can take pictures and have it seem as though our lives are perfect and yet behind the scenes it is anything but. I want you to know that no matter what we are all here for you. Tammy it's so nice to hear you're back but on your own terms and because blogging brings you happiness. (HUG!) We continue to think of you and your family. It's funny to hear you say you feel invisible in a visible world because I see a lot of poise, style and taste in your photographs - I think you stand out in a great way!